Get ready to become a "human network"
, but E Ink reckons they've all got it wrong. 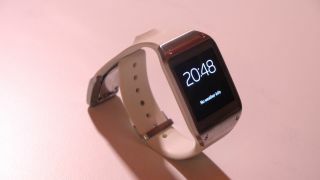 TechRadar spent some time talking to E Ink's Director of Product Management, Giovanni Mancini, who explained where the current crop are going wrong and where the future of wearable tech lies. "Some of the smartwatches so far have been panned because they give the user something else worry about without offering any additional functionality," he told us. "We believe smartwatches will only really take off when they deliver functionality which is unique to a capability." Smartwatches need a screen and they need a battery to power said screen, and therefore there's already a significant amount of weight on the wrist before you start popping everything together. The main smartwatches around at the moment are using LCD displays which are relatively weighty, not the most slender and require a larger battery pack - and this is something E Ink thinks it can solve. "E Ink displays (which are black and white, not colour) enable a lightweight device which doesn't require significant battery or the weight of a LCD screen," Mancini explained. "The smartphone provides a platform which gives you a significant amount of compute power and a high level of connectivity. This means wearable devices need to be more along the lines of having sensors in them that will provide unique capability. "You can then take advantage of the smartphone as a computer engine to provide information for later processing." Mancini suggests that instead of having a smartwatch, you instead have a device aimed at a specific area, such as exercise, to provide you relevant information on that activity. "That information then can be offloaded into your smartphone, either because you need it to do additional computing while you're exercising, or you want your phone to capture the information and make it available online," he said. "Essentially what you then have is a series of devices which are then specialised. Think about it more of you becoming a human network as opposed to a smartwatch which is basically a smartphone with a smaller screen." Perhaps smartwatches are purely just a halfway house in the wearable tech life cycle, and if we're honest we can't see too many people dropping big bucks on such a device after shelling out a similar amount for a smartphone. At the end of the day it comes down to do you actually want information delivered to you from your mobile via another device, or can we all just live with the fact we'll need to fish our phone out of a pocket if we want an update? Fancy a smart watch? Why not check out the Samsung Galaxy Gear or Qualcomm Toq?